There’s something timeless and dreamlike about A Fantastic Woman by Sebastián Lelio. Perhaps because it’s set in a far-off yet familiar-looking Santiago de Chile, a place that looks a bit like a fictional, Almodovaresque Spain. Perhaps it’s because of its hypnotic soundtrack, mixing beautiful, aerial flute-led compositions by Matthew Herbert with salsa, disco and classical arias. Perhaps it’s because of its mysterious, Hitchcock-like atmosphere which sees tension and outrage slowly building up. 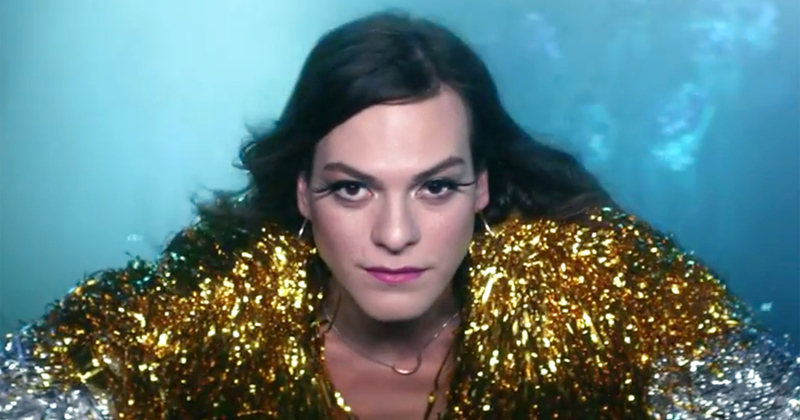 Most definitely it’s because of its brilliant cast led by transgender actress Daniela Vega, who imparts an incredible magnetism and shines throughout. After a cheerful birthday celebration, Marina (Daniela Vega) and her older boyfriend Orlando (Francisco Reyes) return home and go to bed. In the middle of the night Orlando wakes up in pain and is hit by an aneurysm. On their way to the hospital, Orlando falls down the stairs making Marina an easy suspect. But whether she is guilty of any abuse it beside the point, what the police or the family of the deceased can’t tolerate is Marina’s otherness. With Orlando gone, she has lost everything. She can’t keep their dog Diabla or stay at the flat, she is even prevented from attending Orlando’s funeral by an increasingly violent ex-wife and son. But with little given away the viewer understands that Marina has seen it all, and has grown a thick skin. She is a fantastically strong woman, a woman of few words displaying impeccable posture and composure even after enduring terrible humiliation and abuse. Despite all the threats, she knows she what she wants and she will fight for it. She wants to come to terms with her lover’s death and be treated like any other human being. What would have been a very distressful subject is treated very thoughtfully and subtly, and despite the ordeal that Marina is going through, Lelio never errs on the side of sordid realism or full-on tragedy. The film is bright, colourful, optimistic. Marina walks alone, she has no friends but she is not a victim. She is empowered and is not going to give up. As she seeks to resolve Orlando’s final mystery, the plot unravels like a detective story rather than a social drama. The grotesque villains who treated her as though she was a monster are vanquished and good prevails. Eventually Marina finds solace in classical music and there is a beautiful scene where Daniela interprets Ombra Mai Fu by Handel in a slightly off-pitch but heartfelt way on the stage of a magnificent venue. It’s brilliant that A Fantastic Woman, which was produced by Pablo Larrain (Neruda) and Toni Erdmann director Maren Ade, won this year’s Oscar for the Best Foreign Language Film, and Sebastián Lelio and Daniela Vega are certainly ones to watch out for.